POLEMIC & PARADOX: LOCAL MHA'S WIFE POTENTIAL ONTARIO PREMIER? 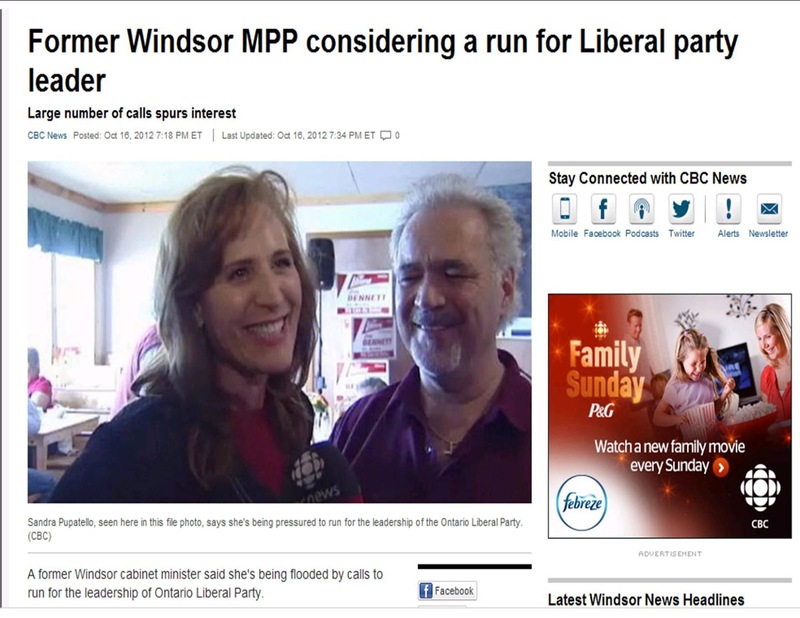 LOCAL MHA'S WIFE POTENTIAL ONTARIO PREMIER? The wife of St. Barbe MHA Jim Bennett is rumored to be considering a run at the leadership of the Ontario Liberal Party. Sandra Pupatello was the MPP for Windsor-West for 16 years and served in some of the provinces top cabinet positions including Minister of Economic Development and Trade. She retired from politics prior to the last provincial election. Bennett, a former leader of the Newfoundland and Labrador Liberal Party is said to be considering a run at the parties leadership in 2013.